So who had VCU playing Florida State in the Sweet 16? Come on, be honest! God I hate those Miller Light less taste more taste commercials. I don't care if I wear a Speedo, show up with bronzer and wear sunglasses in a bar, there's no way I want a living on tips "Barely Living on Tips" waitress insulting me. Hate those commercials. What the hell was Duke's offense doing with about 4 minutes left against Michigan? They were just standing around clueless while Nolan Smith pounded the ball into the same spot on the floor. After a 36 minutes, why did they just let their offense stagnate the shot clock down. Weird. And stupid. By the way, what was that weird design on Duke's white uniform. Looks like a soft print of Tron underneath their white jerseys. Weird. So one team is reportedly offering a first rounder for Kevin Kolb. If I were the Vikings, Cardinals or 49ers I would make that deal in a heartbeat. Kolb is better, in not at least a sure thing, compared to Locker, Gabbert, Newton or Mallett. And wow, suddenly the Eagles look like major players this draft. Next time you guys are considering the biggest draft bust in NBA history, you have to put Hakeem Thabeet in the conversation. Drafted 2nd in the 2009 draft—5 picks before Stephen Curry—Thabeet's career consists of 2 trips to the NBA Developmental League;then he was traded with a number 1 pick for Shane Battier; and he has a career stat line that reads, 2.3 ppg, 2.8 rpg and 10.9 minutes per game. Uggh. This guys is way up higher on the Bust-ometer than Michael Olowokandi or Kwame Brown. I wrote Saturday that the Yankees might want a more reliable righty off the bench than Andruw Jones. Since I wrote that, Jones went 0-2 and looked really bad doing it. I hope Cashman is on top of this. I'd rather have had Marcus Thames, bad glove and all than this. So the Mets just ate $18 million to make Oliver Perez and Luis Castillo go away. The first step to a full recovery is admitting you made a mistake, so "Way to Go Mets!" PFW has an interesting article rating the Top ten 2010 draft classes one year after the fact. Intersint if you're into that stuff—which I am—but I would rate the browns class higher than 10th. If you're top 2 picks are all-rookie, and your 3rd pick is a QB, best the Saints and Patriots and looks like a potential franchise QB, I'd say that's not a bad draft at all. Gotta say, I love Bobby Hurley's answer to Jalen Rose's Fab Five attack. Good stuff Bobby and Grant against that blowhard, Jalen. The refs had no business not checking the replay on that last shot in the Washington—North Carolina game. Then to come on T.V., say you didn't check it but didn't need to—jeez....I call B.S. Shoddy, unprofessional work. No excuses. 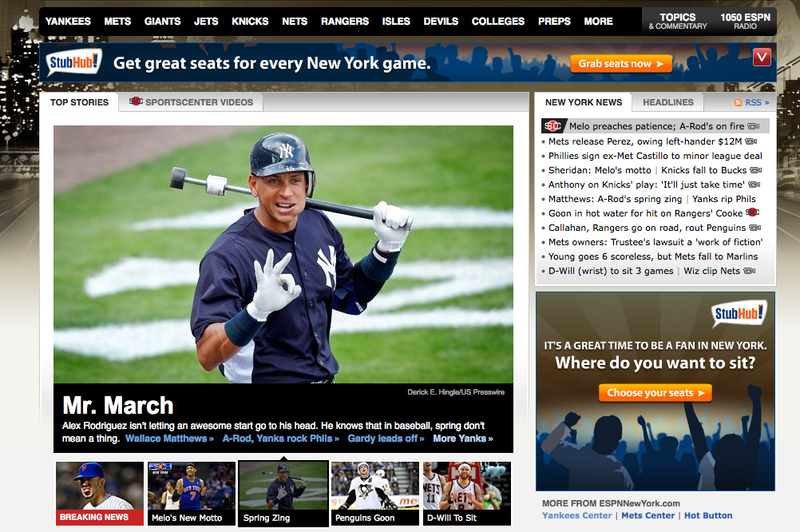 And lastly...check out this picture and tell me the media doesn't hate, hate, hate Alex Rodriguez. Yes, he's a doof and a cheat, and you should absolutely call him on that. But unnecessary attacks like this—the guy is having a nice spring, you really have to call him Mr. March—make me want to defend him. And I don't want to defend Alex Rodriguez. So bust on the crap he pulls, but don't do the unnecessary attacks. It's unprofessional. I didn't have FSU vs VCU, but I am currently 3rd in my bracket. I don't think I will remain that high though. I didn't even think VCU should be in the Tourney. I agree with you on the Miller Lite commercials. Obnoxious. Duke was on the right track taking time off the shot clock, but they weren't even running their offense. They got away with one. Duke's not the only one with that. St. John's has something similar. And it is a little odd. 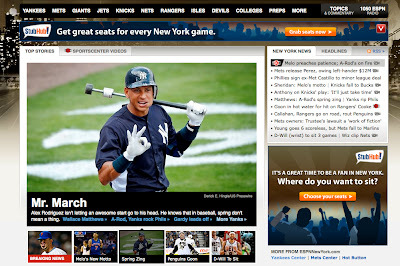 Agreed on A-Rod. I seem to remember him knocking the cover off the ball during a title run not too long ago.